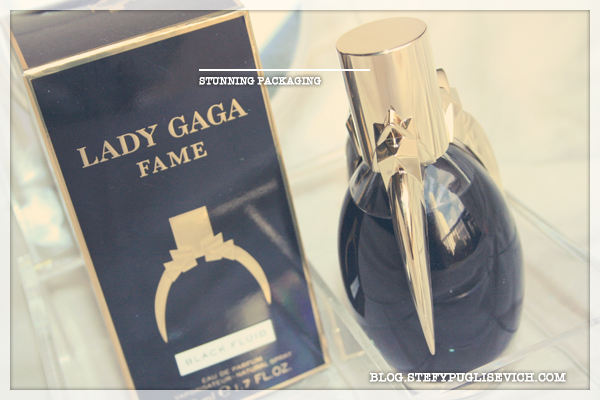 Fame by Lady Gaga. This is one perfume i had been dying to have a sniff of. I didn't know what to expect from her. I was at Gatwick Airport when i had a whiff of this spellbound fragrance and i was taken by surprise by how it smelt, it lingered and the fruity smell followed me around. I am not the only one who must of found it amazing how black fluid turns to invisible as it hits your skin. I am one for fruity floral perfumes and this was one i am truly happy with. I do not normally buy celebrity brand perfumes as i tend to find them a bit cheaply made and not that attractive but this was an exception especially with the design of the gorgeous bottle. The gold claw was IT for me. I had to have it sort of thing. I walked out of the duty free, caught my flight home and purchased a 50ml bottle from the Plane at just £25 which for a celebrity perfume is a good price. HAVE U PURCHASED A CELEBRITY PERFUME?